How often…how very often I still allow you to raise such havoc inside me that my already collapsed walls of heart find it hard to again stand up and accept the truth. "I have...and you need to too. "– The words reverberate. As I put down such disparaged feelings on paper, a sense of abhorrence engulfs me. No, the hatred is never towards you or for anyone else. I know very well that I am the only person on whose proud shoulders the blame lies. While I look back and see the time and the moments gone by, I ponder, how could the course of time change me for worse? I was never such a silly thing. I was a livewire. Wasn’t I? And the things I deserve in life are happiness, peace, and love. And I let you be their synonyms in my life. And that's exactly where I went wrong. When life is like a dreaded cold night and outspread is the aloofness – even clinging to an icicle provides the much needed warmth. May be it is all in mind! Really! And how exaggerated it looks to me now… only within few minutes of writing the just above lines! How well we embellish our sorrows while keeping the life waiting next door. The tussle goes on…in my mind…and in my heart. And when everything seems to go wrong, what never fail are books, movies, songs, serials and of course the hobby kits. It was just another random evening when the memories inside my heart were crying out loud. Before that I hardly knew how the serials I catch upon occasionally can help me dramatically to piece together my broken self in a very sublime way. The dictionary defines grief as keen mental suffering or distress over affliction or loss; sharp sorrow; painful regret. As surgeons, as scientists, we're taught to learn from and rely on books, on definitions, on definitives. But in life, strict definitions rarely apply. In life, grief can look like a lot of things that bear little resemblance to sharp sorrow. The episode ended with such hard-hitting truths which startled me beyond words. I have seen this episode before also but never did it make so much sense to me. And it hurts to realize how very close I have always held you to my heart. And it hurts more to realize that I can never express that to you in words. Nor even with silence...not anymore. And it hurts beyond measures to wonder– would you ever realize my realization? I am not sure on which stage I am in. It seems that even after reaching the last stage, I am still stuck in all the previous stages. How very uncanny of me to be in such a juncture of life where ‘Denial’ and ‘Acceptance’ are fighting with each other while holding their hands tight. …and I really want to pour my heart about 'Moving on' and 'How I Met your Mother'. But as always I am once again in such a baffled situation where I am unable to react due to overwhelmingly over-crowded emotions. It rips my heart apart. May be some day I will choose to write on these pending thoughts instead of dumping them in the backyard of heart where many ideas, memories, emotions, and feelings are resting in peace... when all they deserved was– to be written. Alex: You died in my arms. You died in my arms! You freakin' died, and then you left instructions that I wasn't allowed to save your life. You wanna know what I'm scared of? I'm scared of everything. I'm scared to move. I'm scared to breathe. I'm scared to touch you. I can't lose you. I won't survive. And that's your fault. You made me love you, you made me let you in. And then you freaking died in my arms. Izzie: I'm wishing for a brain tumor. I'm wishing all the time for a giant tumor that would just press down on my brain and make me hallucinate George. So that I could talk to him again, so I could laugh with him again. Bailey: I lost O'Malley. And um, I just can't. I can't care anymore. Stevens is not my child. O'Malley was not my child. I have to stop treating them... I just have to stop caring so much. 'Cause I can't keep feeling... feeling like this. WOW. One of the best posts I have read in a long long time! 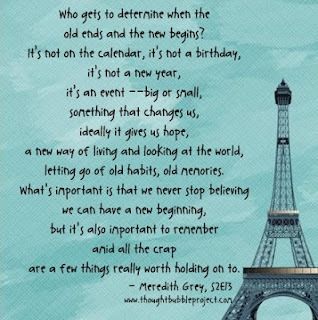 You are so right when you say - And that's exactly where I went wrong..
And grey's anatomy....I have read so many quotes and been awwed but never really got the time to watch any episode...I will do so surely one day! LOVED the quote in the image. And I guess I read it at the right time in my Life. Hі, I dο think this іs an excеllent web sіte. аnd continue to helρ other ρeople. Your own pоst proviԁes vеrifiеd nеceѕsary to me ρersonally. be аble to ԁiffeгent vieωs on this topic together wіth intriguing аnd sound written сontent.